Hi, a well meaning relative has bought me a Railroad Class 31 in Dutch engineers grey that is too modern livery for the 1960s era of my layout. Not wanting to offend her by selling this loco I thought of fitting a replacement body shell to the loco. I understand that this was originally a Lima product. 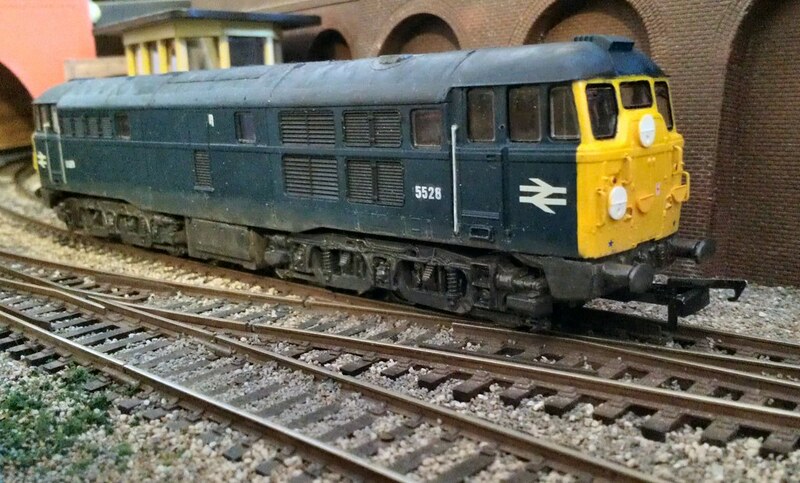 Is it possible to fit a Lima or even a Hornby or Airfix class 31 body without much butchering involved to keep the peace in my home ? I have thought of repainting in the two tone green of the 60s but I'm not keen in case I make a mess, any thoughts ! Thanks luckymucklebackit, I thought of that but it would be the wrong livery for the early 60s era of my layout. I have seen photos of a single green scheme but I think It would be easier to do a body swap. brakeman wrote: Hi, a well meaning relative has bought me a Railroad Class 31 in Dutch engineers grey that is too modern livery for the 1960s era of my layout. Not wanting to offend her by selling this loco I thought of fitting a replacement body shell to the loco. I understand that this was originally a Lima product. The Hornby RailRoad model is essentially the Lima model with a more modern chassis, better motor, better wheels, and better electrical pickups. The Lima bodies will clip straight on (apart from possibly needing a plastic pillar on the glazing shell clipped). Any Hornby RailRoad or Lima 31 body will be a straight swap, but the older R351 model, and the newer super-detailed Hornby models, would take a lot more hacking to get them to fit, if at all. Likewise the old Airfix one would need a lot of work to get it to fit. Hi SRman. That's what I feared ! So I will keep an eye out for a Lima body or risk a re paint. I have seen some great paint jobs ( an some no so good ) so I will get some info on what to do and maybe try myself. It may well be worth a repaint. While you are at it, you can correct any detail anomalies, and shave off the moulded handrails on the fronts and replace them with wire. I had a Lima body I detailed some years ago, and put it on a Hornby RailRoad chassis. I had to make up the cowlings from plastic card to get it back to the correct style for the period, but it wasn't that difficult to do. The close-up photo does exaggerate the rough edges of my work, but at normal viewing distances it is fine. One thing I haven't done (yet!) is to correct the exhaust vents to represent the English Electric style (the Lima model has the Mirrlees style, which is incorrect for the model in BR blue.